Anise Hyssop Blue Spike Agastache Foeniculum is a lovely, flowering perennial herb. Also commonly called Licorice Mint, this flowering herb can be started from seeds. Anise Hyssop Blue Spike produces violet-blue, fragrant, bottlebrush-like, flower spikes of hundreds blue-violet flowers which appear in summer and fall filling the air with minty fragrance and attracting bees, hummingbirds, and butterflies. 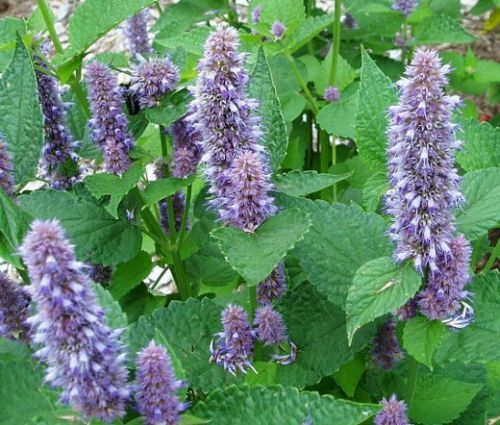 Anise Hyssop Blue Spike easily establishes itself in herb and wildflower gardens making a wonderful addition to perennial borders, containers, and large pots. Agastache Foeniculum is long flowering, heat and drought tolerant, insect and disease resistant perennial. Licorice Mint makes a superb cut flower and tolerates dry locations that prove to be difficult for many other perennials.